Above: Animal and Plant Health Agency flowchart from suspicion to slaughter. Produce a farm profile so that Animal and Plant Health Agency can quickly understand your business. Don't be afraid to ask Animal and Plant Health Agency for advice. Add Animal and Plant Health Agency to your phone contacts. Erect security notices ie. "Do not feed the pigs". What if I suspect a notifiable disease? If you suspect a notifiable disease, you must tell your local Animal and Plant Health Agency office immediately. Google the Animal and Plant Health Agency number for your region now and put it in your mobile phone. Assuming your suspicions cannot be negated over the phone, Animal and Plant Health Agency will probably place immediate restrictions on your unit — nothing on, and nothing off. This applies to all people, vehicles, animals, agricultural products etc. The rational for this is that if there is sufficient suspicion for the agency to visit the farm, then there is good reason to take measures to prevent any spread of the disease. Having taken your call, and having informed Defra's disease unit, Animal and Plant Health Agency will dispatch a veterinary officer immediately and he or she will get to your farm as quickly as possible. The veterinary officer will then examine your suspect animals. He or she will also look round the rest of the farm as it is important, with exotic disease, to build a picture of everything that is happening on the farm. At this stage it is possible that, based on the clinical signs, the movement restrictions can be lifted and the case closed. If the case cannot be closed Animal and Plant Health Agency aims for a proportionate response, based on the available information. Defra, scientists and Animal and Plant Health Agency strategists will hold an amber telephone conference and the European Commission will be informed about what is happening — as early reporting generates trust and ensures the United Kingdom maintains its reputation for being open and trustworthy where disease reporting is concerned. Also, at this stage, Animal and Plant Health Agency may start tracing animal movements, in case tests are positive and standstills have to be imposed. How long before test results come back? Generally the first useful test results are available in 24 hours but it may be three to six days before the labs can give an all-clear as it is easier to confirm a disease than to negate it. It would take about 36 hours to identify African swine fever at the Institute of Animal Health at Pirbright, whilst classical swine fever takes 24-48 hours, at Animal and Plant Health Agency Weybridge. What happens if the tests are positive? If exotic disease is confirmed, the movement restrictions on the farm will be widened. Activity to trace animal movements will be ramped up and culling will start. The most effective action that can be taken to control a viral disease is to kill infected and exposed animals as soon as possible, whereupon the virus starts to die. Trade restrictions will be put in place immediately. Other activities will include disposal of carcases, and the United Kingdom will formally brief the European Union and World Organisation for Animal Health. How do I prepare a farm profile? If there is a suspected outbreak on your unit it will be an incredibly stressful time for you, your staff, and your family. There will be people on the farm investigating the disease and you will have a lot on your mind. The last thing you will want to do is sit down with someone and answer a lot of questions. So Animal and Plant Health Agency suggests you prepare a Farm Profile now — in peacetime — which paints a picture of your pig business. 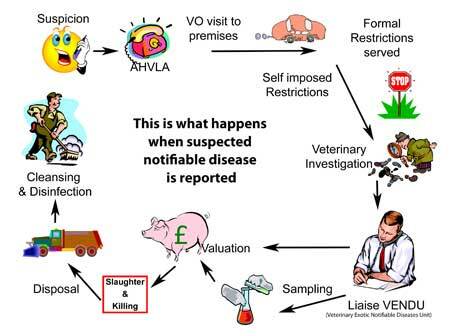 Your description will be used to help all the scientists, policy-makers and veterinary officers who have to make decisions about the suspected outbreak on your farm. The location of your business. Number of sites and their location. What do you do — breeder-finisher, finisher etc. How many pigs you have on site. Where you get your stock. When, how and where you move stock. Direction of flow of the pigs. Vaccinations and other health treatments. How do I prepare a contingency plan? Foot and mouth disease (2007).